Medicinal uses: As a calming and soothing herb to treat minor sleeplessness and nervous stomach disorders. Also stimulates appetite and demonstrates activity against bacteria, fungi, and viruses, and is an ingredient in ointments and creams for topical use (Chevallier 115). 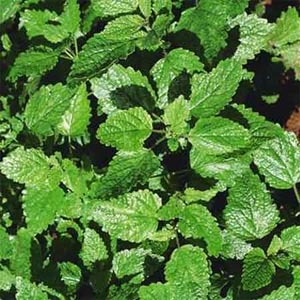 Additional uses: Steamy lemon balm facials are recommended for persons with acne. It also has reputed insect repellant properties. Consider tossing a handful or two of the leaves into the fire to prevent being bugged (Kowalchik 357). Cautions: Do not take essential oil internally (Chevallier 115).